They're one of the A-List's happier tales from 2016, having gone from strength-to-strength after hitting it off at the Golden Globes in January. And their honeymoon period shows no sign of ending, as Orlando Bloom and Katy Perry enjoyed a low key, loved-up date in Los Angeles over the weekend, after the actor admitted he was 'proud' of his 'amazing' girlfriend. Heading out to Malibu the 39-year-old Lord of the Rings star and the Roar singer, 32, took in a spot of shopping whilst spending some quality time together. Clearly making the most of their down-time together this festive season, the couple headed out to enjoy an afternoon alone. Keeping a low-profile on their afternoon date, Katy wore a hoodie pulled up over a cap, before further obscuring her features with a pair of thick black Ray Bans. The Dark Horse singer completed her laid-back and under-the-radar look with some navy jogging bottoms and a pair of trainers. Orlando went for a less 'going incognito' look than his lady love, but also was clearly in the mood for a relaxing afternoon. Keeping things casual the Troy actor teamed a grey sweater with a pair of drop-crotch joggers and some black biker boots. The British-born star finished his look off with a black beanie, which held his blond wavy locks in place. It looked as though Katy was being treated to a pre-Christmas gift, as the globe-conquering star clutched a tiny black shopping bag in one hand. But with both stars having a litany of commitments, it wasn't long before Orlando had to leave Katy's side. 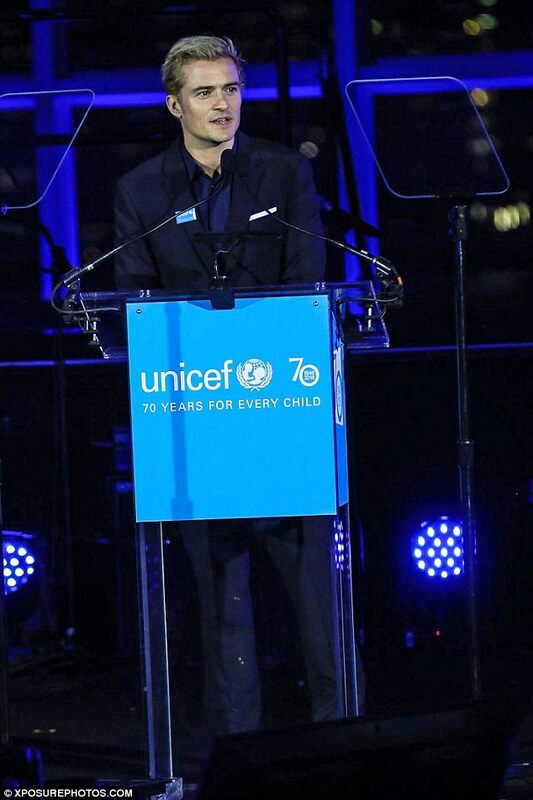 On Monday the actor jetted to New York for UNICEF's 70th Anniversary Event at United Nations Headquarters. But whilst he may have been away from his love, she was clearly still on his mind as he praised her in his speech. As part of his role as a Goodwill Ambassador for the organisation Orlando took to the stage to make a speech, and said of his girlfriend: 'She’s amazing, you know, I’m super proud of the work that she does. The star, who shares five-year-old Flynn with ex-wifeMiranda Kerr added: 'Being a father, you know, you kind of have a new sense of responsibility. 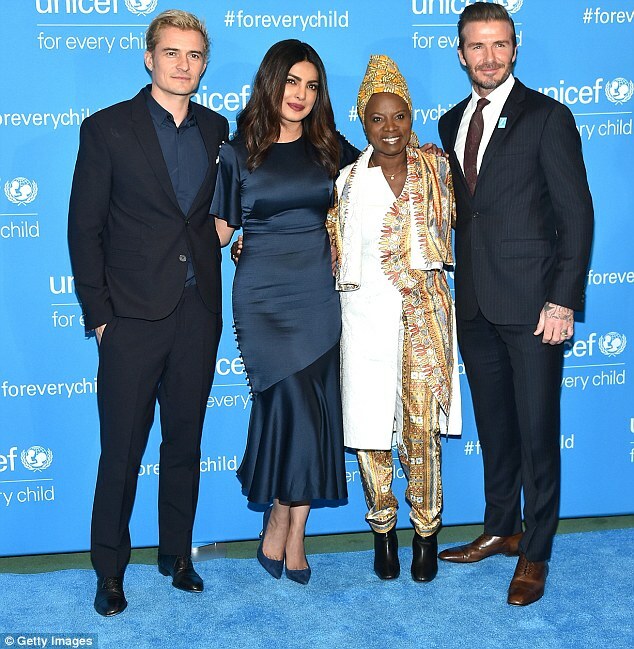 The Pirates of The Caribbean star joined other famous faces at the star-studded celebration, including, David Beckham, Priyanka Chopra and Angelique Kidjo. As well as his speech, Orlando was also seen interviewing a young advocate for UNICEF, Mustafa Al Said. Good chat: As part of his role as a Goodwill Ambassador for the organisation Orlando took to the stage to make a speech as well as interviewing a young advocate for UNICEF, Mustafa Al Said.